That the growth in iOS has been phenomenal hardly needs to be stated any more. To people like me, though, who have been Apple users since the Mac Classic, it's been an amazing ride. I am and have always been obsessed with software. While the media obsess over new hardware, I've always been far more interested in the capabilities of software. Better hardware - generally - just saves me time. A faster iPad will be great, but what shall we do with it? Three times in my career, Apple has shipped software that conventional wisdom said basically couldn't be done. The first was the Carbon layer of Mac OS X: most of the Mac toolbox running on a preemptively multitasking, protected memory Unix kernel. The second was Rosetta: PowerPC apps running unmodified and, for the most part, perfectly well on Intel processors. iOS was the third. Conventional wisdom said that you couldn't possibly get a desktop OS running on a phone. Conventional wisdom said that you couldn't get rid of a user-visible filesystem. Conventional wisdom said you couldn't require all software on the platform to come through a first-party app store. Right now, just before WWDC 2013, I think it's important to take time to appreciate exactly what iOS has achieved. iOS broke the tyranny of the hierarchical filesystem as a user interface. A concept so complex that possibly the majority of computer users never achieved any level of real competence in its use. A far larger proportion certainly never achieved any kind of mastery. iOS turned the purchase and installation of third-party software from a great opportunity to destroy your computer into something that people do for fun. People of very low technical ability are now perfectly safely and competently administering their own computers. This is a revelation and, in my opinion, a big part of the IT backlash against iOS. iOS solved the virus problem. The conventional wisdom of the PC years was that Windows got viruses because it was vastly more popular than the Mac. In the post-PC years, we have hundreds of millions of people using iOS and, so far as I know, zero viruses. There are other achievements I could list, but the point is that iOS broke through a lot of conventional wisdom about how computers should appear and operate. So where are we today with iOS? We have a powerful mobile operating system with excellent APIs that enable a broad range of powerful applications to be developed. Despite that, some of the fundamental design choices in iOS are limiting the growth of the platform. 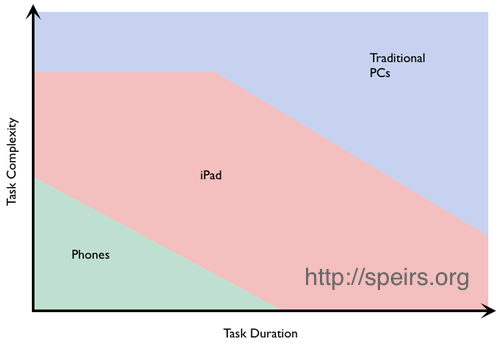 The chart that I use to explain the appropriate deployment of smartphones, iPads and desktop computers uses two axes: task duration and task complexity. iOS does a wonderful job in the lower-left corner of the chart. Right now, though, I think iOS needs to attack the upper-right corner of this chart. There is an opportunity to completely eliminate the desktop computer for some and drastically reduce its importance for many more. What does such an attack look like? Well, there are various sources of complexity in the use of a computer for a task and some of them still either overwhelm iOS or simply become too awkward to tolerate. One source of complexity is having to use multiple tools to achieve the result you want. On the desktop, the common transport for doing this is the filesystem: save a file from one app, open it in another. iOS needs to support the user in that task without breaking the filesystem abstraction that has been so valuable in making iOS approachable for less technical users. The current mechanism of "Open In...", which allows an app to copy a file to another app, is enabling some decent workflows but has the drawback of littering each app's sandbox with a copy of the file. It's also difficult to move large files this way. If I want to take a PDF stored in Evernote, edit it with PDF Expert and save a modified version back into the same Evernote note, I simply can't do it today. The fact that so many iOS apps have built in direct support for Dropbox is testament to how weak the Dropbox app itself is. This is no criticism of Dropbox; they're doing all they can, given the design of iOS sandboxing. This also applies to chunks of data that are not files: URLs, strings, photos. A great recent example: I like to use Flipboard and Flipboard recently introduced a new feature where you can create "magazines" from web pages. I normally use Instapaper for caching stuff to read that passes by on Twitter, which I read with Tweetbot. Tweetbot supports a few read later services, including Instapaper, Pocket and Pinboard. It doesn't support Flipboard, and there's nothing I can do to make it support posting links to Flipboard apart from begging the Tweetbot developers to add it. The burden of inter-app integration should lie with the destination app, not the originating app. If iOS had a generalised "send this piece of data to apps that claim to handle it" service - yes, like Android does - all the work to allow posting a link to Flipboard from Tweetbot would be in the hands of Flipboard and not Tweetbot. Similarly, the common workflow of saving an image to the Camera Roll and later extracting it in another app leaves behind data detritus that could be avoided if direct communication were easier. The TL;DR of this section is: iOS should support AirDrop, and it should be available as an "Open In..." target. Moving data between two iOS devices without using a Dropbox-like service, email or, worse, a Mac has always been annoying. Apps like iFiles leverage Open In... to work around the problem but, again, you end up with a copy of your data in iFiles' sandbox as well as the originating app. There is another compelling argument for supporting WiFi Direct: Apple TV. The challenge of mass deployment of Apple TV on networks are well documented. What if a future Apple TV could receive AirPlay streams without the need to even be on the network? That would be a Very Big Deal. Of course, this requires additional support in the WiFi chipsets built into iOS devices but there's no inherent reason it can't quickly become a standard capability. One of the bigger limitations of iOS has always been that, every so often, you'll try and do something that's "too big" for an iOS device to do. As the hardware itself becomes more powerful, these situations grow fewer but they still remain. In particular, they tend to persist in areas that involve handling a large chunk of data. Examples include: trying to import a video from the Camera Roll into an app, opening a large Keynote file, applying a complex set of adjustments in iPhoto. Using Open In... can sometimes fall over if the file is large. To some extent, these things are hardware-dependent. As CPU, memory and storage levels increase, these issues should diminish but there are clearly some aspects of these that are OS-dependent. iCloud backup is really great. You set it and you forget it but, increasingly, I see a need for more granular access to the backup. Restoring your entire device just to get one missing file back is quite a drastic step, particularly when you have made other changes to data on the device since the file was lost. Right now, iCloud backup is a brilliant disaster recovery mechanism. You lose or destroy your iOS device and you can be back up and running in a very short time. What it is not, currently, is a great user-error-recovery mechanism. If you screw up, you're staring a whole-device restore in the face. The current situation with internet passwords on iOS is, put simply, crazy-making. I use 1Password and, short of making it my main browser, it is maddening to have to keep switching between Safari and 1Password to get logged into a site. The fact that I have a bookmarklet on my Safari toolbar whose sole purpose is to open the current URL in 1Password tells its own story. I don't know exactly what the solution to this is. Giving mobile Safari the ability to run extensions isn't quite enough unless those extensions can communicate with an app also installed on the system. Regardless, this is becoming highly frustrating. The entire mechanism of usernames and passwords is out of date. It'd be great if Apple could lead the way on building in platform level support for 2-factor authentication. I'm not enough of an expert on this to comment much further but this needs to get easier. The iOS keyboard is good, but it could be better. I haven't spent a lot of time with the alternative keyboards on other platforms but they are said to be ahead of iOS. I think more work could be done to make autocorrect more predictable. My main complaint though is about the text selection interface. We now know from some experience with gestural interfaces that interactions requiring tap-and-hold just plain feel slow, whether they actually are or not. The iOS text selection gestures depend heavily on tap-and-hold to precisely place the insertion point loupe. I do not think that iOS needs to embed deep stylus support. Nonetheless, there are increasingly good digital ink apps for various applications: art, drawing, PDF annotation and so on. Many of these apps have built their own wrist protection systems. Some are better than others and none of them behave exactly alike. In addition, none of them play particularly well with the iOS four-finger multitasking gestures. Some system level mechanism for doing wrist protection alongside the multitasking gestures would go a long way to easing this problem. Power users are often also highly mobile users. One of the main reasons I use a third-party app over the Apple Podcasts app is that, with Instacast, I can download a podcast of any size but Apple's app continues to enforce the 50MB download limit on cellular networks. This limitation made sense in the early days of iOS, where everyone was on unlimited data connections. Today, most people are on metered connections. We pay for every byte, so we should be allowed to choose exactly how we spend those bytes. Of course, a warning would still be useful. Some people are on metered contracts which, after a cap is reached, impose astronomical charges. Along with this change, I think a system-wide governor on mobile data usage would be useful. You can imagine, though, how Apple might be reluctant to build in such a feature and then undoubtedly face a rash of "Waah! Apple cost me thousands in data charges!" headlines every time someone doesn't understand how the feature works. The question of changing default apps has been a contentious one at times in the life of iOS. Until recently, I had not seen many examples of compelling replacements for Safari and Mail. Today, though, that's vastly different. There are really good alternative browsers now, in the form of Chrome, Dolphin and others. The official Gmail app is lacking in some ways but its a perfectly good alternative for Gmail users. On the iPhone, I have been using Mailbox since the day I got to the head of the queue and would love to set it as my default mail app. I don't think a generalised UI for changing every protocol handler in the system is necessary at this point. However taking two baby steps by allowing the user to choose their browser and mail client (and perhaps a third in choosing their maps app) would be a good start. I would like to see some policy around preventing apps from setting themselves as default handlers. The user needs to remain in control of this. I'm not a regular Bluetooth keyboard user but I do use one occasionally. The apparently increasing popularity of Bluetooth keyboard cases suggests that people do like to regularly use a keyboard with their iPad. To better support this, I would like to see a few enhancements to the Bluetooth keyboard support in iOS. In particular, a method of keyboard-navigating the multitasking bar would be very welcome. I imagine this as a Command-Tab keystroke opening the bar and subsequent strokes highlighting successive apps which can be chosen by hitting return. That's all I have for now. There are certainly more things that could be added. I have focused here specifically on the issues that are limiting deeper adoption and utilisation of the iOS platform for the 'power user'. There are certainly other concerns that a casual user or a beginner would have. My broader point, though, is that iOS does NOT need a ground-up rethink, nor does it need to become more like our existing desktop OSes, in order to satisfy more of the needs of the power user. This conceptually small set of changes would go a long way to pushing iOS deeper into that high complexity/long duration section of my chart above.